We have great news! We recently protected 937 acres of redwood forest in the Santa Cruz Mountains. This land is now forever protected and will serve as a refuge for wildlife. Learn more here. For decades, researchers thought the trees within a redwood "fairy ring" were genetically identical. But it turns out that's not always the case. Learn why that matters. We're lucky to live close to so many towering groves of redwood trees. But let's be honest, we all have our favorites. Here are our top four. 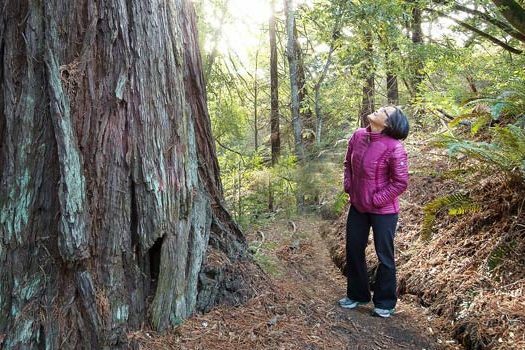 We have a plan to restore the redwood forest at POST-protected San Vicente Redwoods - we're working to make giant trees. Watch the video and learn more. Celebrate this May 4th (#maytheforestbewithyou) with these three hikes. Who knows...you just might find an Ewok Village in our redwood forests. Coho salmon in San Vicente Creek near Davenport are on the brink of extinction. We're fighting for the survival of these fish. Here's our story. Here we share a map that shows you where to find some of the biggest and old trees in the Santa Cruz Mountains. See these giants for yourself! Learn how short, slow, contemplative walks through the forest can dramatically improve your health and wellbeing! Sometimes things just come together, it all just lines up for a win-win for conservation. This is one of those stories from POST-protected San Vicente Redwoods.